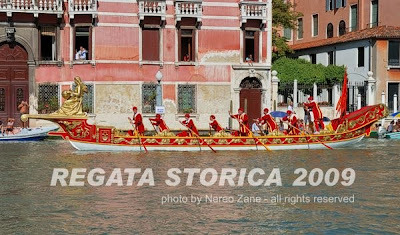 And just in case you missed it, yes, the Regata Storica has it's own Facebook page! Amazing. There's a Facebook page for everything these days. I'm thinkingg about launching a Facebook page for my car. I love my car, and I think my car deserves it's own page. I wonder how many friends it would get. 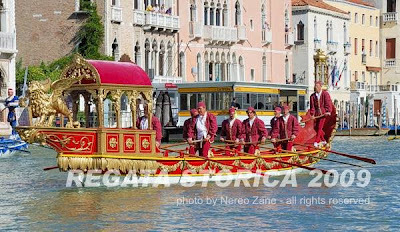 Red and gold abound in Venice, and especially when it comes to the pomp and circumstance of a procession afloat. But this greem one really catches my eye each time I see it. We've all seen the winged Lion of St. Mark. He's usually holding a book which is open to display words in Latin. > But this green [bissona] really catches my eye each time I see it. The guy in the stern, is he wearing a turban, maybe? If so, then it may be a historic re-enactment of the ottoman ambassadors's galley, green being the prophet's color. That habit is still preserved in the italian flags on sea. Warships have flags with a crest depicting a sword-bearing lion and italian merchant ships have crests with a reading lion. The italian naval crest is a combination of the coat of arms for Amalfi, Pisa, Genoa and Venice city-states. I think you may be on to something here Tamas. 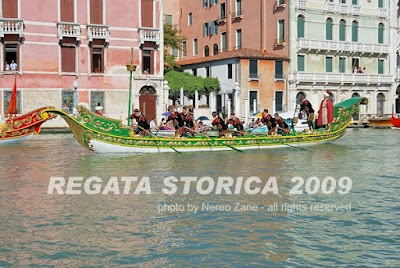 I know that many of the boats in the procession are meant to portray vessels from other kingdoms. Thanks to you and Nereo for the great pictures! Very enjoyable! About that lion... Travel around the Adriatic Sea and you'll see the lion and his book in many many places. Every place that Venice once ruled usually has the lion on some historic building. The book is NOT always open. For places that welcomed Venetian rule, the book is open. For places that were conquered by force, the book is closed. Keep an eye out for those lions and books. Now if I can just find a good excuse to get back over there to look!